1. To treat those who have geographic or financial barriers to dental treatment. 2. 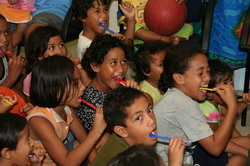 To teach and educate patients in rural areas oral hygiene. 3. Where possible, to work with local dentists, providing continuing education. 4. To motivate and inspire dentists, dental students, and others in the joys and satisfaction of humanitarianism. Since 2007, Drs. Williams and Dyer have led 6 exploratory expeditions and 5 dental teams to the remote areas of Samoa, Guatemala and India. In April, Wide Open Humanitarian will travel to Honduras to treat children and adults in La Ceiba. Future trips are in the works to Panama and Honduras. Watch the YouTube Video below to see what a typical trip is like!